Europe’s regional airports are taking off in popularity according to latest findings from ForwardKeys, which predicts future travel patterns by analysing 17 million booking transactions a day. Some of the boost can be attributed to specific events like the 2018 FIFA World Cup in Russia, but other long-term factors are at play, like the growing popularity of travel, increasing pressure on the major airports, human curiosity to keep discovering new places and the success of low-cost airlines. According to the World Travel & Tourism Council (WTTC), the direct economic contribution of European regional travel was up 3.8% in 2017. That is significantly faster than the overall GDP growth of the EU, which was only up 2.3%. 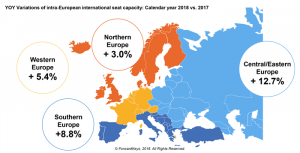 Encouragingly for the economy, ForwardKeys reveals that intra-European international seat capacity is growing fast, in the face of ever-increasing demand. In 2018, intra-European seat capacity is up 6.0% on last year. The growth has been strongest in Central/Eastern Europe, up 12.7%. In Southern Europe, it is up 8.8%; in Western Europe, it is up 5.4% and in Northern Europe, it is up 3.0%. As well as Russia developing regional capacity for the World Cup, Georgia was up 23%, Ukraine 18%, Poland 17% and Latvia 16%. They were the top-growing countries this year. And in southern Europe, Turkey and Greece both bounced back. Many regional airports across Europe showed significant growth in terms of intra-European capacity. Regional airports like Aarhus, Bordeaux, Ufa and Antalya are top performers within their respective sub-regions. Russia has ambitious expansion plans for its regional airports, taking advantage of the momentum from the World Cup. In 2018, seat capacity to long-haul destinations from Europe is up even more – by 9.1%, although the seat volume of long-haul flights is substantially less than that on intra-regional flights. It was the smaller European airports where capacity grew quickest, with the ten largest European airports showing slower growth.